Your Commonage .ie: Irish RDP Application will not be approved in 2014. Irish RDP Application will not be approved in 2014. Irelands RDP application will not be approved before the end of the year. A press release from the EU Commission has confirmed that the first 3 RDP applications have been approved. These were from Austria, Denmark and Poland, a further 6 (from Finland, Portugal along with 4 from Germany) will be agreed before the end of the year. While this is disappointing, it is not surprising, considering the scale of the task faced by the EU Commission in dealing with all 118 applications. In addition the task of rewriting large parts of the Irish RDP to address the 266 observations made by the Commission will inevitably take some time. At this stage getting the plan right is certainly worth a couple of months delay. There is still time to make the adjustments necessary to deliver high quality schemes to support Irish Agriculture for the rest of the decade. It is essential that those who can secure this do not waste the opportunity, it will not come again! The full text of the EU Commission press release can be seen below. The European Commission has today approved the first three of 118 Rural Development Programmes (RDPs) aimed at improving the competitiveness of the EU farming sector, caring for the countryside and climate, and strengthening the economic and social fabric of rural communities in the period until 2020. 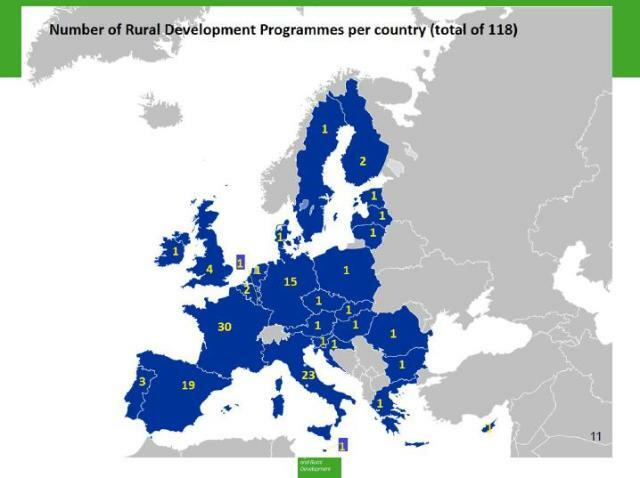 Operating at either national or regional level, the 118 multi-annual programmes are backed by EUR 95.6 billion of total EU funding over the period 2014-2020 through the European Agricultural Fund for Rural Development (EAFRD) and will draw in additional national, regional and private finance. In addition to today’s programmes – the national RDPs for Denmark, Poland and Austria – a further 6 programme will be adopted before the end of the year, meaning that programmes worth more than 20 billion EURO will have been cleared. "Our rural areas – with the farm sector and the many other types of business which are based there – give us jobs, opportunities for rest and recreation, natural beauty, and pleasant places in which to live and work. But they need help to unlock their full potential. The next generation of Rural Development programmes is about to deliver that help. Today we have approved the first 3, with a further 6 to follow next week – accounting for roughly 22% of Rural Development spending from the EU budget. We estimate that programmes covering approaching one third of the funding will be cleared by Easter. One of the great strengths of our Rural Development concept is that we have 6 core priorities, but it is up to each Member State or region to design programmes which suit their situation. And we see good examples of this today where the Polish programme is aiming to create more than 22 000 jobs, provide investment support to roughly 200 000 farms and to establish some 1 800 producer groups. In Denmark, we see particular emphasis given to fostering innovation, with the objective of creating almost 1000 "green jobs", moves to double the area of organic farming, and investing in environmentally-friendly farming practices. In Austria, there is particular priority given to environment and climate concerns, with a target of more than 80% of agricultural land managed to protect and enhance biodiversity, and training opportunities for more than 600 000 farmers, whilst around half the rural population should benefit from improved services such as high-speed broadband. Rural Development is the so-called 2nd Pillar of the Common Agricultural Policy, providing Member States with an envelope of EU funding to manage nationally or regionally under multi-annual, co-funded programmes. In total, 118 programmes are foreseen in all 28 Member States. The new Rural Development Regulation for the 2014-2020 period addresses six economic, environmental and social priorities, and programmes contain clear targets setting out what is to be achieved. Moreover, in order to coordinate actions better and maximise synergies with the other European Structural & Investment Funds (ESIF), a Partnership Agreement has been agreed with each Member State highlighting its broad strategy for EU-funded structural investment.